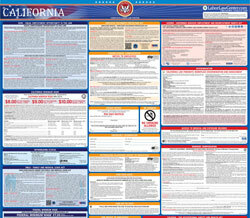 The Industrial Welfare Commission (IWC) Wage Order #17 Miscellaneous Employees is a general labor law poster poster by the California Department Of Industrial Relations. This poster is mandatory for some employers, including employers in miscellaneous industries. This poster, written in Spanish, must be posted in a conspicuous place where all Spanish speaking employees will see it for any miscellaneous industry employers. This poster describes the standards and laws that must be followed by miscellaneous industries. It appears you don't have a PDF plugin for this browser. Please see the link below to download california-iwcarticle17.pdf. Labor Code .) The amendments and republishing mak e no other changes to the IWC’s Orders. and Workplace Flexibility Act, ” Stats. 1999, ch. 134 (commonly referred to as AB 60). wage orders in effect in 1997, or otherwise  exempted by law, are covered by this order. hardw are, softw are, or system functional specifications. gr am s, including prototypes, based on and related to user or system design specifications. CAD/CAM, but who is not in a computer systems analysis or pro gramming occupation. as the Wor ld Wide Web or CD-R OMs. w.di r.ca.gov/IWC  or by mail from the Department of Industrial Relations. fects used in the motion picture , television, or theatrical industry. eight (8) hours in a 24-hour period. (B) “Shift” means designated hours of wor k by an employee, with a designated beginning time and quitting time. (C)  “Wor kday”  and  “day”  mean any consecutiv e 24-hour period beginning at the same time each calendar day. is a fix ed and regula rly recurring period of 168 hours , seven (7) consecutiv e 24-hour periods. (D) For the purposes of this section,  “primar ily” means more than one-half of the employ ee’s  work time. in excess of eight (8) hours on the seventh (7th) consecutiv e day of work in a workweek. ’s regular hourly salary as one-fortieth (1/40) of the employ ee	’s  weekly salary. been work ed for the purpose of computing overtime compensation. is required to work the reduced hours. an alter native workweek schedule. Section 12940 of the Government Code. the  alter native workweek schedule established as the result of that election. schedule established by the election. day ’s rest in seven (7). in  the  form  of a written agreement proposed by  the employer . within  that alternative workw eek schedule  need not be	 specified. the c riteria for an identifiable work unit in this subsection are met. language,  as  well  as in   English,  if at least  five  (5)  percent  of the  affected  employ ees  primar ily  speak  that non-English  language . shall mak e the election  null and void. by the Labor Code may  be	 repealed by the af fected employ ees. Division of Labor Standards Enforcement ma y gr ant an  extension of time for compliance. shall include the final tally of the v ote, the size of the unit, and the nature of the business of the employer. not be required to  work those new work hours for at least 30 days after the announcement of the final results of the election. subject to Labor Code Section 98  et seq. VIOLATIONS  OF CHILD LABOR LA WS are subject  to civil penalties  of from  $500 to $10,000  as well  as to criminal penalties. appr oval to take personal time off and mak e up the work hours within the same workweek pursuant to this section. w ai ved  by  mutual consent of the employer and the employee. meal period is not provided. addition to the amount which is sufficient to recover unpaid w ages. paid in addition to an amount which is sufficient to recover unpaid w ages. (C) The affected employee shall receiv e payment of all wages recovered. wages for overtime work in violation of this order. and make it available to every employ ee upon request. Santa Barbara, Santa Rosa, Stockton, Van Nuys. P.O. Box 420603, San Francisco, CA 94142-0603. Departamento  a: P.O. Box 420603, San Francisco,  CA 94142-0603. 7718   Meany   A v e .
1550   W .   Main   St.
election  ballots  or  election  procedures.